This is probably the most popular recipe on my blog of the last 4 years and I am not surprised! This soup has the most epic flavors and complex, rich broth- it’s truly like having the best Thai takeout at home, only it will just take you less time than waiting for delivery! Deep down I want to do things like make homemade Pho Broth and scratch Ramen, but the truth sadly is that I am just too lazy, too short on time and desperate for immediate gratification. And that is what this soup will give you. Almost immediate gratification. In 15 minutes you have a broth with depth of flavor that will confuse you into thinking that it was simmering away all day. And the instant cook rice noodles shave even more time off and have the most wonderful texture ever. The pile of fresh toppings cuts through the rich broth and makes the whole soup sing. While I loved that this was such a fast and easy meatless meal, you could certainly add some shredded chicken or thrown in a handful of shrimp for the last 2 minutes of cooking to make it even more hearty. Combine the garlic, ginger and curry paste in a small cuisinart (or mince and mash together in a small bowl). Add the coconut oil and combine everything well. 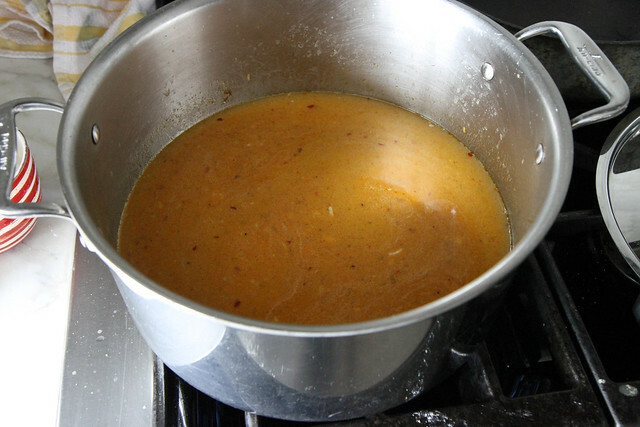 In a large pot, heat the curry-coconut paste over medium heat, frying the paste gently. Add the broth and deglaze the pot. Add the coconut milk and bring the broth to a boil. Season to taste with kosher salt. Place the noodles in the boiling broth. Garnish with fresh cilantro, thai basil, red chili’s and green onions. 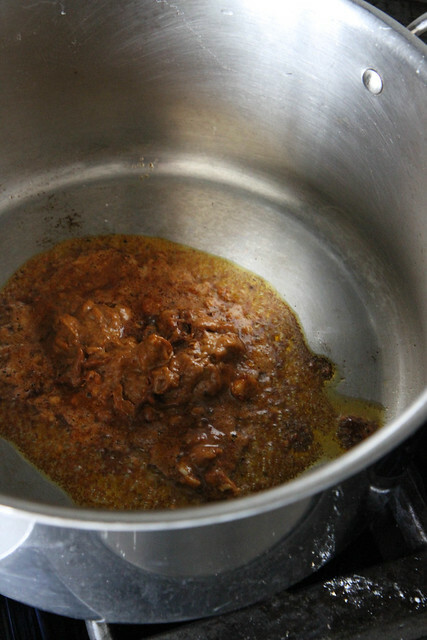 In a large pot, heat the curry-coconut paste over medium heat, frying the paste gently for 1-2 minutes. Add the chicken broth and deglaze the pot. Add the coconut milk and bring the broth to a boil. Season to taste with kosher salt. Either place the noodles in the boiling broth, or pour the boiling broth into a bowl of dry noodles and let the soup sit while the noodles cook and soak up the hot broth. This is my idea of the perfect comfort food. 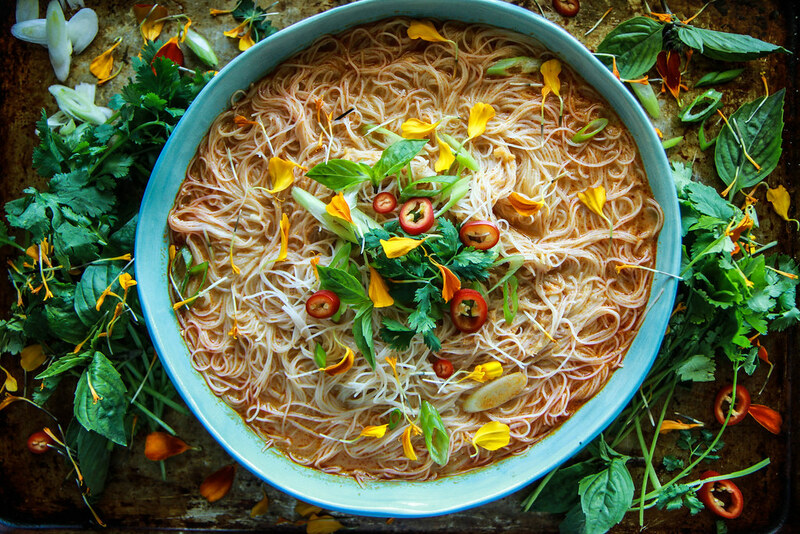 A bowl of richly spiced, slurpable noodles, yes please! Any recipe with “Thai” in it always seems mysterious and complicated with ingredients I don’t have a clue about but this is so simple! It sounds so delicious. Well done, Heather! TOTALLY simple Vicki!! I have always felt the same way, but it is that little jar of store bought red curry paste that makes all of the difference. i also think the coconut milk gives the broth a body and depth it would not have had otherwise. Plus, I thought of you and a few other regular readers/commenters that are vegetarians!! I can’t believe this is so easy to make! Definitely want to try this with some shrimp or shredded chicken. Kelley- you can EVEN do this: Saute an onion in the curry paste and when soft, remove it and set aside. Then sauté the shrimp shells of a half pound of shrimp in the leftover paste/oil, and then add the broth and coconut milk. Simmer with a lid on for 15 minutes. Then I scooped the shells out with a chinese spider strainer and then added the onions back in and the noodles and threw the half pound of shrimp in. AMAZING. This soup is gorgeous and I love that it only takes 15 minutes! Can’t wait to try this one. That looks soooo good right now! It’s -8 here without the windchill and I need some of this ASAP haha. Really great pics Heather, and that soup just looks complete bonkers good! Thank you SO much Gerry!! Wow, this is pretty amazing Heather! Pictures are gorgeous! And the recipe looks amazing! I will most definitely be making this! Wow – this sounds so delicious! Such gorgeous photos! I simply love that this takes no time to make. Warm, comforting goodness! This looks delicious. Is the coconut milk you use the rich kind that comes in a can or the thin kind that comes in a carton like Soy Milk? Thanks Nadine- I used the thin kind that come in a carton at trader joes. Great. Thanks for the quick reply! I will pick some up tomorrow. That explains things! I used the really thick and creamy coconut milk from the can and it was almost too heavy to handle! The color was also less vibrant. Super yummy!!! Kids loved it (didn’t use all the curry paste). Thanks!! So happy that your kids liked it!! I love the look of all those noodles!! KILLER soup! This sounds so great and simple!! Curious if you think olive oil would work in place of the coconut oil? I don’t typically use that, everything else I have already. Sure Janelle!Ot even vegetable oil- Especially if you still have the coconut milk on hand- that will round the flavor nicely. Defiantly going to have to try this!! Thanks! This looks so amazing!! I made a different variation of a Thai chicken noodle soup the other day–but your version is making me crave it all over again. Gorgeous pictures! I made this today for my lunch and it tasted amazing. It was so easy and quick to make too. I added some chopped chicken and a boiled egg and it was delicious. Thanks so much for sharing. Awesome Kara! So glad that you like it!! ooh, this makes me want to dip into my Asian pantry and start playing with these flavors again. I’ve been stuck on pho, but curry noodles can beat almost any cold day at its own game. going to make today where do you get rice sticks and red curry paste? Just look in the Asian aisle at the grocery store- mine were at my local supermarket. If they don’t have rice sticks, get rice noodles and cook in the broth for a few minutes longer. I’ve been fumbling around looking for some type of stir-fry concoction to make with the odds and ends in my refrigerator. This is the answer! I only have green curry paste, but I think that should work just fine. Yum! Pingback: The Courier » Soup’s On! 9 Comforting Recipes! I tried this today and really liked it. I found that adding a tablespoon of sugar and a tablespoon of curry powder increased the complexity of the flavor. Thanks for posting. great feedback eastside food bites! Thanks for sharing! I noticed in the comments section that you used coconut milk from a carton. Do you think the stuff from a can would work? I honestly don’t know what the difference is! Consistancy, maybe? It’s snowing here and I can’t wait to make this, but I only have canned coconut milk! Anne- canned coconut milk is the same thing- it is perfect!! Keep Warm! This is by far the BEST thai curry recipe I have ever made. All the others were lacking something, but this one has the perfect amount of flavour and heat. Thank you Lori- I am so happy to hear that! I made this tonight and LOVED it! I added more broth, it was a bit on the spicy side for me, and chicken, to make it a little more hearty. THANK YOU! Awesome Mari! Yes, if you change the broth out it is vegan! Just made it for lunch. SO GOOD!! We added chicken as suggested. I will be making this recipe again! (And again)! We tried pouring the broth over the noodles and they didn’t soften enough so next time we will put them in the broth and cook first. It may be the kind we bought. Cee- you could use either kind! YUM, made this today for lunch, didn’t have thai curry paste but was still delish and satisfied my noodle craving!! What can you use if you are allergic to coconut? Barbara- not sure about the end result, but I would sub chicken broth for the coconut milk and maybe add a splash of cream at the end for some richness and creaminess. Got all the ingredients except the red chilies 🙁 any substitutes? Gorgeous photos! I have been making large batches of beef pho all winter (freezing half the broth for another day). Excited to try this recipe out for those times I crave it without time for my labor intensive version. I’ll report back after I’ve made it. Thanks for sharing! Well written and full of flavor, this soup is sure to hit my sweet spot. Thank you! Thanks for the recipe – made it tonight for dinner and it was delicious! The rice sticks packet I bought says to soak the noodles in hot water and then boil and drain them. Did you do that too or do I just open them up and dump them in to the broth? If it is the really skinny rice sticks like in the picture just dump them in the broth! if it is wide rice noodles, i might rinse them in hot water and then boil them in the broth. This looks delicious. 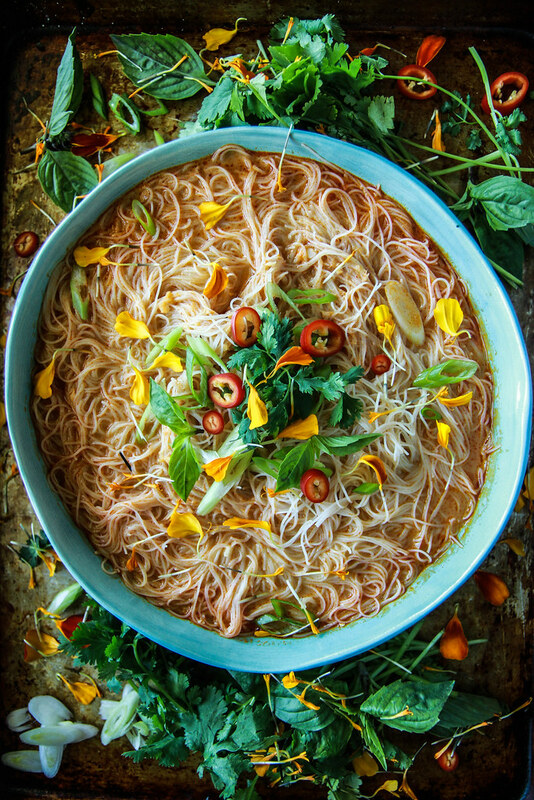 I make my Thai noodle soup with some shredded leftover chicken and add a little fish sauce and tamarind paste- it gives the sauce a sweet and sour kind of taste. Yummy! Sweetened or unsweetened coconut milk? Made this last week, added chicken sauteed with peanut sauce as an additional topping. It was SO good!!! Thanks! I made this yesterday and it was delicious. My husband suggested next time we add shrimp and mushroom which we will. Thanks! I just made this tonight. It was absolutely delicious! Thank you so much for sharing this recipie. I added some chicken cut into strips. I sliced the chicken thin and marinated it in 1 Tbs of ginger, 1 Tbs of curry paste, a tsp of garlic powder and 1/2 cup of coconut solid (from the can of coconut milk). Then I grilled them and cut them into strips. I topped the soup with the chicken and it was an absolute hit! Thanks again! I will definitely be making this another day. This is a great recipe, I have made it three times and have at times added chicken, shrimp, bell peppers, carrots, potatoes, and onion. I use 2 cans of light coconut milk (Trader Joe’s) and it turns out delicious. 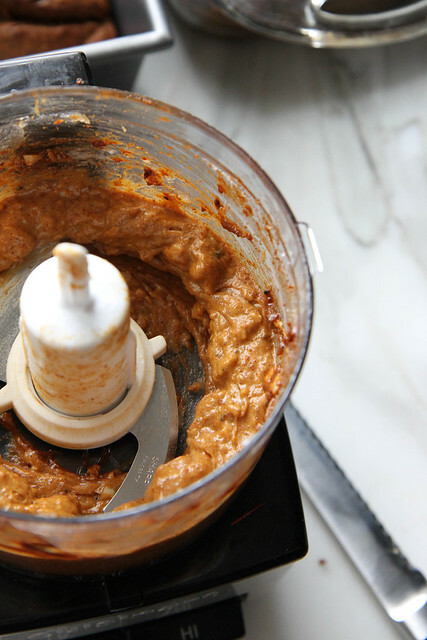 What brand red curry paste do you use? I can’t make this enough… thankfully Im the only one in my house who eats it so I don’t have to share but this is YUM!!! Haha!! I am the same way Sara- my kids are not into the curry- but I can’t get enough! Would it be ok to us curry powder vs the paste? Yes! It is a different flavor profile (I assume you are talking about yellow curry powder?) and without the heat. So I would start with a tablespoon and then decide if you want to add heat, or more powder. Also, make sure to dissolve it well i n the hot broth so it isn’t grainy or powdery! Good luck!! This dish is simply AMAZING!! There is so much flavor along with a good heat that makes your nose run lol. I couldn’t find thai basil but sweet basil was good with this dish as a substitute. This is my 2nd time making this within a month! The 1st time I added shrimp to it and my 2nd time making I left it out and got grumbles because of that. Thanks for sharing this simple but yummy recipe! I just love Vietnamese food………..it is the bat of Asian food. So I made this for dinner last night we added chicken and it was really good we knew we woyld want it again but it felt like it was missing something, I had the leftovers for lunch and holy moly its delicious the next day!!! Pingback: Time to Get Back into Cooking! I love Thai- so when I saw this, I had to make it. Never mind it is around 80* here today! I used Trader Joes organic fat free low salt chicken broth and Trader Joes light coconut milk (in a can). This needed salt, and I also added sugar to taste. The sugar really helped the flavor profile. The cilantro took the soup to the next level. My rice noodles were very thin which made this slurpy yummy delicious! This is going to be my go to soup this winter. Thank you for sharing it! Super yum – I added some lime juice which really seemed to add to the complexity of flavors! Thanks! This looks delicious. I’m considering adding some chicken and veggies (sprouts, snap peas, cabbage). Do you think this would ruin the simplicity of the dish? I like to experiment with soups, working off great bases, but I’m not so familiar with Asian-style soups and wouldn’t want to muddy the flavors by adding in too much extra stuff. I think it sounds delicious Beth!! Great, flavourful soup..I substituted half of the chicken broth with broth made from soaking a couple of handfuls of dried mushrooms, it added a little more depth & flavour. I also added shrimp and broccoli flowerettes. Keep up the good work! I added some chopped butternut squash to the oil to Carmelize before adding the spice paste and there in some spinach at the end. It was delicious. Will made add prawns tomorow and up the spice Factor. Yum! Sandra- It just means that you want to add the liquid and then scrape up any little browned or cooked on bits on the bottom of the pan and then stir them into the liquid. Hope this helps! THis soup looks awesome! What delicious combination of flavors….thanks for sharing! Fantastic soup. Made it heartier by dropping in some chicken. I have made this so many times in the past 3 weeks! My husband says it’s one of the best things I have ever made. I typically add shrimp, enoki mushrooms and mint. This was delicious! I sautéed onion and peppers at the start and added leftover chicken. Wonderful with Jasmine rice if you want to change up the noodles. This was AMAZING! The broth is the best thing ever. This looks delicious AND beautiful! Thanks for posting. I would like to make this tonight for my family, and I’m wondering if this recipe is just for one serving? Hi Naomi- this should feed 4, but if your family has big appetites you could always double it! This is AMAZING! I added some shrimp to mine. My 5 year old daughter said, “Mom! How did you make this? It’s sooooo good!” 🙂 I had the leftovers for lunch twice during the week. I’ll definitely be making this again SOON. Can’t wait to make this. With all the snow we are getting this year this will certainly make things better! would it be okay to use chicken broth with no sodium in it? Do I have to cook the rice stick noodles first? On the package it says to put it in boiling water for three minutes and then drain. Or do I just put them in the broth right out of the package? Looks delicious! If I were to make a double batch can you freeze some for later?? I only have green curry paste and reg ground yellow curry powder. Does either of these sound like a good sub? And ratio suggestions? This soup looks divine! Meaghan- I would use either! and it is probably about the same- the paste is just suspended in the liquid.I can’t wait to hear- will you let me know if you use the green curry? Hi Hilary! I would use vegetable oil- it will be great! Just made this. It is so good and easy to make. This is quick and delicious! The only change I’ll make next time is to double the broth and add some fish oil and jalepeno for a nice kick!! This is amazing! I added a little bit of fish sauce and a squeeze of lemon and it was absolutely to die for! Hi Ali! I use red fresno chilis that are at all the grocery stores in Seattle? If you can’t find them just use a jalapeño. My friend turned me on to this recipe and I love it! Even though I am a total baby when it comes to spicy foods, I can handle this one just fine. I usually saute cubed tofu and thinly-sliced onions and mushrooms in toasted sesame oil to add to the soup. So good!!! Thank you for sharing this recipe. This looks so delicious! If I’m not planning on finishing this broth in one sitting (more like, if I can resist finishing it all at once), how can I store it? Thanks so much! Can’t wait to make this! Any tips on adding shrimp? Soup was as amazing as it looked in the pictures! Great job!! Oh my gosh, Heather….this looks incredible. I’ve been looking for a recipe like this forever and I think I’ve found the one. Can’t wait to try it. Do you mind if I link up to this on my blog this week. It’s such a great one to share. This soup was absolutely delicious! So flavorful, satisfying, and perfect for a chilly night! It was very simple to make but tastes like you slaved over the pot all day. Great recipe, I can’t wait to make it again!! Thank You for sharing this recipe…my son & I are in LOVE with this soup!! Just made this and it was delicious! Thank you for the recipe. Tofu will work great in this also. Did you use the really thin rice noodles? It should have been more broth? Try pre-cooking the noodles in separate water before adding to the broth next time- that will give you a much more broth based soup! Oh my yummy goodness!!! I know why you are eating it twice in the last three weeks. I like it a bit spicier so I added a bit more curry paste. My tummy is so full right now. Two of us ate almost all of it!!!! Tried this receipe tonight. Added shrimp..It was a big hit with my family. My 8 yr old son liked it so much he asked that we have it again tomorrow. Zsa- that is so awesome! I love to hear that your son loved it! I hope it becomes a regular! Really originally wanted a clear broth soup, but this looks so ahh-mazing…, gonna add in shrimp too I think…. This has become one of my favorites! I add veggies and sometimes Thai chicken meatballs. Yum! So I made this last night. I appreciate how easy it was. However, I ended up using the entire (small) bottle of Thai curry paste and I made only 3/4 the quantity. I also added a lot of red chili powder. It came out more flavorful after that (and a color similar to that in your photos, whereas before it was too light); however, it could have been even spicier. I don’t know if it was the paste I used (the only one at Whole Foods) but the equivalent of 2 tablespoons of this paste was not nearly enough flavor to the soup. On the back of the bottle, there was a recipe that called for 2 tablespoons for one can of coconut milk (but included shrimp, and said it made 4 servings), and this recipe had four times the liquid, so I think that helped justify adding more paste to me. I added leftover cauliflower and broccoli, and next time I would also add baby corn and maybe snap peas. What a gorgeous soup. Wish that bowl was in front of me right now, I can’t wait to try this! Hi! Quick question: I bought everything for your Thai Curry Soup and your meatball recipe (yes, I will combine). They looked delicious! I can’t seem to print the recipes. What am I doing wrong? I made this yummy soup and it is now a favorite in our home. Intoxicating is not a word I use often but it works for me! I added shrimp the next day to remaining broth excellent. That is awesome Laura- thank you so much! Obsessed with the flavors in this!! Thai flavors are always a good idea! I have a beef curry recipes tomorrow! Can we have a curry party? I love this noodle dish! I love curry!!! yes please! It’s amazing how just a few ingredients can become so flavorful – this looks like a great easy recipe to have on hand! This was fantastic, thank you!! I did add a couple teaspoons of brown sugar to mellow it out a little for me and this will now be in my soup rotation for certain!!! Hi, I want to make this soup for 8 adults as an appetizer, do you think I need to double up on the ingredients? Yes Nina- I think that sounds like a good idea! Can this soup be made a day ahead? I’m bringing this as a potluck for thanksgiving and wanted to make it today and just warm it up the next day. Also I bought the So Delicious dairy free coconut milk on a carton as I read previous comments and you had replied indicating you used carton coconut milk not the can. Let me know your thoughts. 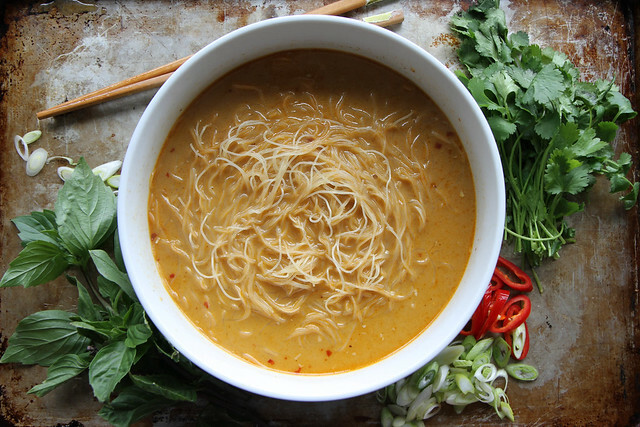 Is this canned coconut milk in the Spicy Thai Curry Noodle Soup? Yes, I used canned unsweetened. It’s a very rare and icy cold day in East Texas….thank you for this recipe. So excited to try! Adding Shrimp!! Heather, thank you for this recipe! My husband is fighting off a cold, so I thought a hot, spicy light soup would help. Love this recipe! I wanted to add extra heat (to keep those sinuses clear… 🙂 I added some thinly sliced jalapeños, ribboned bok choy, bite-sized rotisserie chicken as well as some Sriracha. Having some as we speak, and it is wonderful. Think hubby is already on the mend! (hope so anyway as he is a lousy patient…) Thanks again! 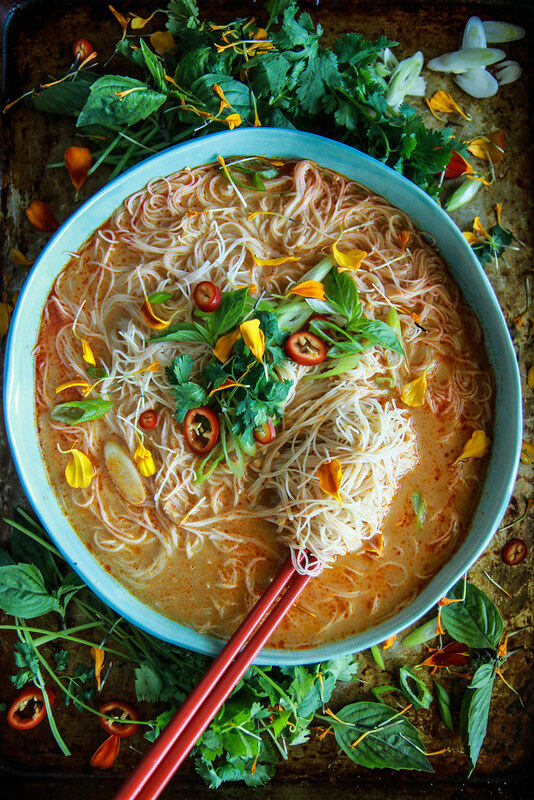 Can’t wait to try the Spicy Thai Curry Noodle Soup. It sounds delicious. We love Thai Chicken Noodle soup served at a local Pho and Thai Restaurant here in town. Will probably add some chicken to your curry noodle soup recipe — maybe not. All of your recipes are wonderfully easy to prepare and don’t require special foods that would not be available here. Hope I can find the red curry paste. FANTASTIC! Made as instructed. Everone loved it. Thank you Heather. Love your dessert, could you make a Pizzelle almond recipe. This is a great base. I make it with tofu and bok choy, and use cooked soba noodles instead of rice noodles. I also add the juice of 1/2 lime at the end. Yum!